September 7 would be the 481st birthday of Elizabeth I of England, so it’s a fitting time to review some of the most iconic and popular screen portrayals of the Virgin Queen. I’m starting with my favorite, Glenda Jackson in the BBC miniseries Elizabeth R, which was first broadcast in the U.K. in February 1971 and in the U.S. in February 1972, as part of Masterpiece Theater on PBS. I’m not quite old enough to have seen this when it first premiered, but I did see it at some point in the ’70s in reruns, and it had a profound affect on me. This, plus attending the Northern California renaissance faire at Blackpoint, are entirely to blame for my fascination with history, costume, and especially the 16th century. This series is exquisite in the level of historical accuracy — from the plot details to the costume to the performances, everything feels, looks, and sounds right. The story covers Elizabeth’s life from the last few years of her sister Mary’s reign until Elizabeth’s death, all in six 85-minute episodes. While some elements are truncated and others are exaggerated, you don’t see any of the crazy invented story lines that happen in some modern versions of her life (*cough* Shekhar Kapur’s Elizabeth *cough*). Also, this production is filled to the brim with Royal Shakespeare Company-trained actors, which adds gravitas to every scene. Between the acting and the dialog, the scenes ring true to (at least my interpretation of) history during episodes like Elizabeth flirting with Dudley and waffling over signing Mary Queen of Scots’ death warrant. Oh, and Robert Hardy (later to star in All Creatures Great and Small on telly and as Cornelius Fudge, the Minister of Magic, in the Harry Potter movies) makes a fantastic Dudley. The casting in the whole series is spot-on. Then there are the freakin’ brilliant costumes! OMG. 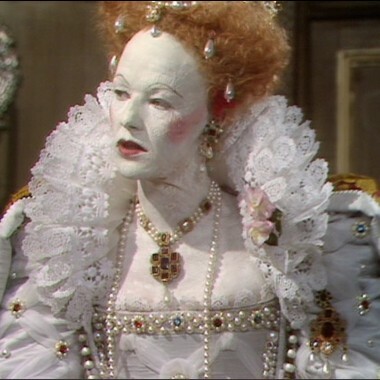 At least six of Glenda Jackson’s costumes are direct recreations from portraits of Elizabeth I, including the well-known Darnley portrait, Phoenix portrait, Armada portrait, and Ditchley portrait. 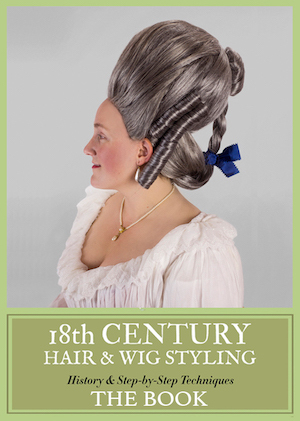 The ruffs, makeup, hats, and hair complete every single look. 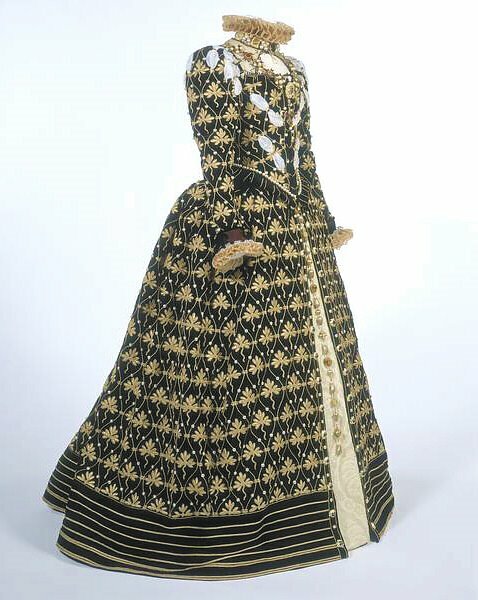 The costume designer was Elizabeth Waller, who won an Emmy for this series, and Jean Hunnisett was on her staff and helped build several of these gowns, which she chronicled in her incredibly useful book, Period Costume for Stage & Screen: Patterns for Women’s Dress 1500-1800. The men’s costumes and extras costumes are equally excellent, and obviously so much of what was made for this series became stock costume for years to come. Check out how one of ER’s gowns ended up in Showtime’s The Tudors later! The only possible complaint I might have about this series is about the first episode, which shows Princess Elizabeth’s tumultuous rise to the throne. Let’s face it, Jackson was in her mid-30s when that was filmed, thus playing the teenaged princess was a bit of a stretch. The episode is necessary to tell the story, and Jackson is an amazing actor in the part; the look is the only thing that doesn’t quite work. It’s a very minor quibble because I think switching from a younger actor to Jackson wouldn’t have worked well either. I suppose some might also complain about the filming quality, being that this was made nearly 40 years ago, long before high definition or CGI. The indoor sets can feel a little claustrophobic, and the outdoor sets are often fake. But I rather find the indoor claustrophobia adds to the feeling of intrigue and machinations around every corner that seem so appropriate to the Elizabethan court. 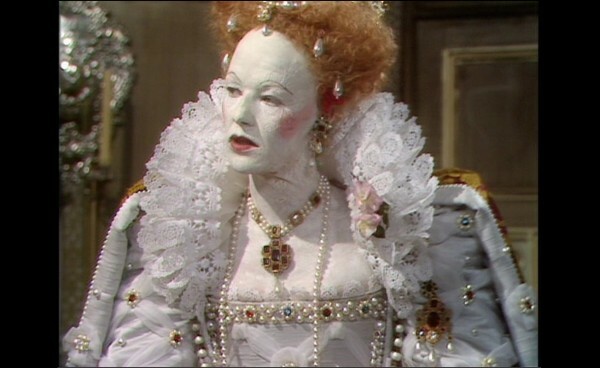 Anyway, for me, Glenda Jackson is the ultimate Queen Elizabeth, and this series will always be my go-to for Elizabethan costume on the screen. 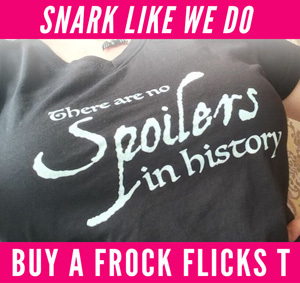 If you like 16th-century history and clothes and you haven’t seen it yet, quick, get the DVDs or find it streaming and fix that now! Costume Captures: Elizabeth R — A treasure trove of screencaps from the series, featuring all the fabulous gowns of Elizabeth (and it’s where I found all the images used in this post). Examining the Phoenix gown — One blogger had the rare chance to look up-close at the reproduction of the Phoenix gown made by Jean Hunnisett for the series. Tons of detail about where it was historically accurate and where it deviated for TV production reasons. The thing I love most about “Elizabeth R” is that it is meant to feel like you’re in the front row in a theatre, watching the action on an intimate level. I can’t think of any film or series that accomplishes this so well. Coming to this a post a bit late….absolutely agree. I love how it doesn’t presume the audience are thick idiots but have an intelligence and curiosity. There is no “dumbing down” in this series at all. Explanations (through exposition) are done very cleverly without being high brow or patronising. 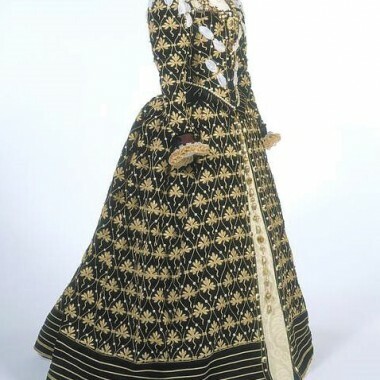 Maybe if I rewatch the series, I may get some inspiration for this year’s Kentwell 1588 gown. I was in 8th grade when “Masterpiece Theatre” ran “The Six Wives of Henry VIII” and “Elizabeth R.” These two series ignited my interest in history, even though I’ve never attempted costumes from this period because there were other historical niches I decided to get lost in. I recently rewatched “E.R” and it still holds up, video quality notwithstanding. The acting is terrific. I have these on DVD and regularly binge-watch. Glenda is my favorite screen-Elizabeth, though I have to say sometimes I felt at times like I saw glimpses Cate Blanchette. Some of the mannerisms and expressions are similar and that would explain why they are my #1 and #2 favorites in the role. Most of the costumes were made of synthetic materials and were machine embroidered, which makes it all the more remarkable how accurate they look.. I remember Elizabeth r when it was first shown on tv in the 1970’s. I liked it then as I like costume historical dramas. I recently brought the series on dvd from amazon. I understood it more the second time around Glenda Jackson was amazing as queen Elizabeth her acting was so good going from a young woman to an older woman. The supporting cast where good too. My other favourite tb series was the six wives of henry the eighth with Keith Michel wonderful portrayal by Keith Michel. Excellent article, and I agree the sets felt off. My experience felt too cold however. They were too spacious, as if they wanted you to enjoy the set, but there was nothing to enjoy. Its as if the set were a barren museum. I wish they would’ve put more effort into furniture and decoration. This was the end years of the Renaissance, after all. Glenda Jackson was my favorite Elizabeth. Of all the worthy actresses who have played the Virgin Queen, she is the only one who made me believe she truly was Henry VIII’s daughter. Her charisma in the role was off the charts.